Travis County ArchivesBlogeventsWho Do You Think You Are? The Travis County Archives will be featured on an episode of “Who Do You Think You Are?” this weekend. Comedian Aisha Tyler, co-host of “The Talk,” visits the Archives and learns about an ancestor who, as a politician, struggled to keep his illegitimate son a secret. 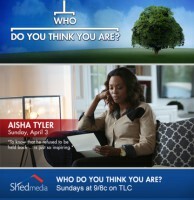 “Who Do You Think You Are?” airs at 8:00 PM Sunday, April 3 on TLC.